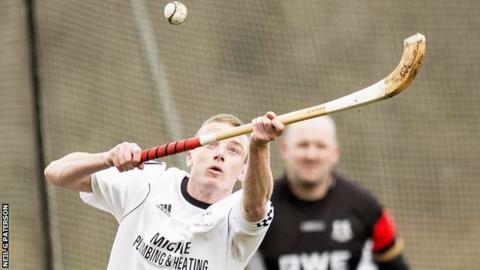 There were major changes at the top of the Marine Harvest Premiership with victories for Oban Camanachd, Lovat and champions Newtonmore as leaders Kyles Athletic slipped to fourth on a free Saturday. Oban, who just two seasons ago were playing second-tier shinty, are the new leaders following a 1-0 home win over Kinlochshiel. They are a point clear of Lovat, who beat Kingussie 3-2 in a frantic finish at Kiltarlity. Newtonmore, who have a game in hand, moved up to third after their 3-0 away win over Lochaber. All three winners overhauled Kyles, while MacTavish Cup holders Glenurquhart also had a free day, receiving respite from their poor start to the season with a trip to New York to take part in the Tartan Day parade in full Highland dress. As recently as 2014 Camanachd won their return to the Premiership as runners-up in the National Division and Aidan MacIntyre's first-half goal now sees them leading the top tier. The prolific Greg Matheson got Lovat off to an early start with his second-minute opener and it took Kingussie a further 73 to equalise through a Thomas Borthwick penalty. With four minutes left, the game seemed to be heading for a draw but suddenly sparked into life. Kevin Bartlett put Lovat back in front again and Borthwick got a second equaliser before Craig Mainland won it for Lovat near the end. At Spean Bridge a goal in each half from Fraser MacKintosh put Newtonmore well in charge before Evan Menzies completed the scoring without reply from Lochaber. The postponement of the game between Skye and Fort William leaves the bottom four unchanged and Fort still looking for their first point. In the Balliemore Cup, shinty's intermediate championship, it was touch-and-go at Cannich between Strathglass and far-travelled Bute. After 120 minutes the score stood at 1-1 when Barry Phimister cancelled out James Craig's opener for Bute. Then, in a sport where penalty misses or saves are commonplace, Donald Fraser scored the only goal after five attempts for each side. In the Aberdeen Considine Sutherland Cup, the reserve championship, Beauly scored a 6-0 victory over competition newcomers Caithness. The game had to be switched from the far north to Beauly's Braeview pitch where Robbie Brindle scored a first-half hat-trick and later increased his tally to five.